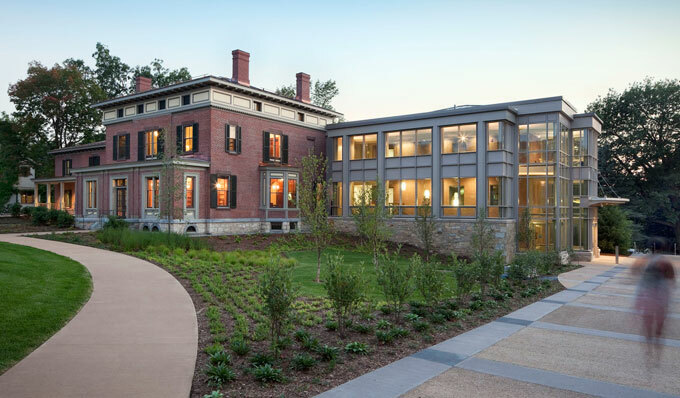 This welcome and admissions center at Champlain College in Burlington, Vermont preserves and expands an 1860s historic structure. According to Goody Clancy’s Jean Carroon, FAIA, the college moved forward with this project during the recession in order to provide economic benefit to the local community; the timing had the additional benefit of savings on the construction cost. It’s been five years since our super-sized housing market collided with the iceberg of reality and began its long descent, eventually pulling the global economy into the frigid depths along with it. The magnitude and origins of this collapse are making the recovery a slow one—and uniquely painful for those working in building design and construction. EBN that the profession had lost “close to 37% of employees” and that architecture billings, a leading indicator of growth in the construction industry, have been anemic for years and appear to be on a second downward trend after a very slight uptick at the beginning of 2011. “The residential side is dismal,” he said, attributing this to overbuilding during the housing boom; and even on the commercial side “we still have excess inventory out there.” Baker has watched the construction industry struggle through a few recessions, but none this bad. “I think we’d have to go back to the ’30s to find anything that was obviously worse,” he said, adding that a recovery would normally take 18 months rather than five years or more. The housing bubble that helped build up the industry after the recession in the 1990s led directly to the current crisis. That unprecedented level of development turns out to be unsustainable, both economically and environmentally, and it may not return in the U.S. in our lifetimes. Design and construction firms—particularly the smaller and leaner ones—live with these realities every day, and not all of them are sticking around to find out what happens next. EBN’s January 2009 recession coverage, “Finding the Green Lining: Surviving and Thriving in an Economic Downturn”) and also thinking of the bigger picture as they adapt, hoping to find a way to grow that will be economically and environmentally sustainable in the long run. We asked our readers to share their most successful strategies with us; we dug deeply into their responses and are passing our ten favorites along to you.